Tina Turner, an Affenpinscher from Lafayette, Ind., undergoes hemodialysis to treat a drug overdose. Tina Turner, in this case an otherwise healthy and mischievous Affenpinscher, came to the Animal Emergency Service of Purdue Veterinary Medicine's Veterinary Teaching Hospital one night recently after ingesting as many as 29 Rimadyl tablets while her owners were away on an errand. Rimadyl, a common prescription treatment for arthritis in dogs, can cause acute kidney or liver injury when ingested in high doses. "Knowing the dose she ingested, it was a dose where we could expect severe gastro-intestinal distress, like bleeding, ulcers, vomiting, and other signs of toxicity," said Dr. Sarah Steinbach, assistant professor of small animal internal medicine. On arrival at the emergency service, Tina's blood panel showed elevated liver enzymes and other evidence confirming toxicity from Rimadyl, so the recommendation was made for her to be seen by the urology team for hemodialysis. Led by Dr. Steinbach, with the help of Dr. Ewan Wolff, small animal internal medicine resident, the medical team assessed Tina's bloodwork and determined that she was a good candidate for dialysis to prevent consequences from the Rimadyl overdose. After a single five-hour dialysis treatment, Tina Turner was able to return home without acute kidney injury despite her binge. Hemodialysis is a method of filtering the blood outside of the body to remove toxins, reducing damage to the kidney and other organs. The blood travels from the patient through an IV into a machine, and the machine sends the clean blood back into the patient. 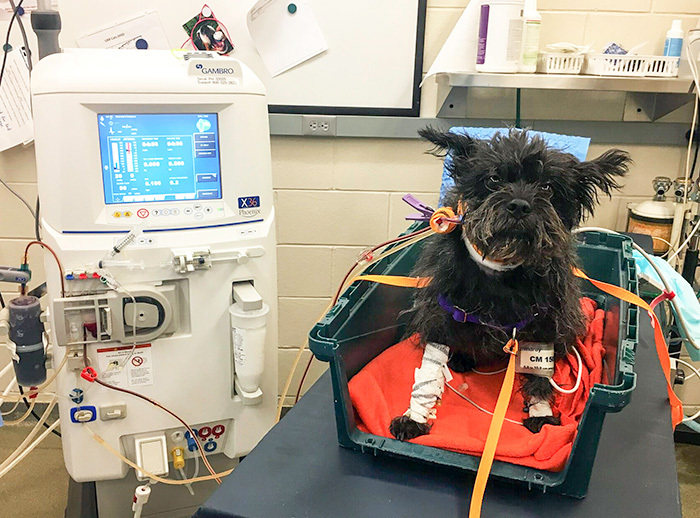 Dialysis for toxicity is relatively new in veterinary medicine, but is increasingly considered as a successful way of managing acute poisoning, according to Dr. Steinbach. 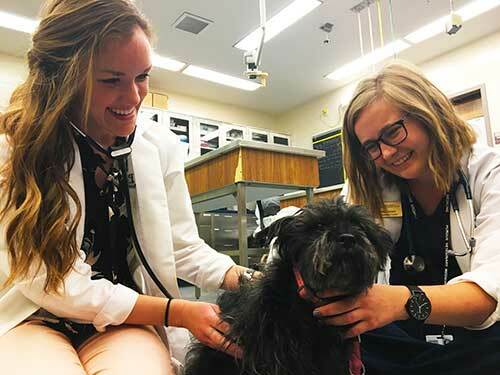 Fourth-year Purdue veterinary students Alexa Barron (left) and Allison Mustonen examine Tina Turner on her follow-up visit after being treated for a drug overdose with hemodialysis at PVM's Veterinary Teaching Hospital. The process that veterinarians use on animals is the same process used on human patients, but the dialysis machines for animals are programmed to handle the differently sized bodies, like that of a cat, dog or goat. Depending on the solubility of the drug ingested and the ability to get the animal in for treatment within a few hours of ingestion, it is often possible to remove all the toxin with a single dialysis treatment, as was the case for Tina Turner at Purdue's VTH. The success rate depends entirely on the reason for the kidney injury and the timing of the medical response. "Dialysis can change the outcome for a patient experiencing toxicity," said Dr. Steinbach. "If caught early enough, it will clear the blood of toxins before they cause damage to the kidney and liver. If you can decrease the level of toxins, you will decrease the level of organ damage."